Analog Source: Rega P9 turntable, RB1000 & Hadcock GH Export arms, Benz Micro MC Silver, Rega Super Elys & Garrott Bros Optim FGS Cartridge. 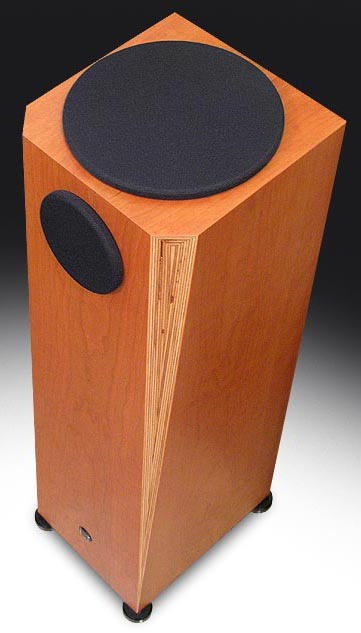 The Om is a tiny little floorstanding speaker from a tiny and little-known German builder of loudspeakers simply known as FJ. FJ's proprietors are Thomas Blumenhofer and Willi Bauer. Both are speaker designers and the running of the production facility falls to Blumenhofer while the naming of the company fell to Bauer who named it in honor of his daughter - For Joanna. That's just about all I've been able to glean about this quiet little company except to say that it is indeed tiny and seemingly very quality oriented [Willi Bauer makes a very famous record player called the dps - Ed.]. Like the company itself, the Om is tiny. Its sealed enclosure measures a stumpy 28 inches tall by 8 inches wide, a little deeper at the bottom (10.5 inches) than on top where it's only 8 inches deep. It's also mass-loaded with sterilized sand, giving the tiny speaker a substantial weight of about 45 lbs. From the listening seat, I could just make out the 6.75-inch SEAS woofer as it pumped away toward the ceiling. The only driver facing me was the Danish 7/8-inch Hiquphon soft silk dome tweeter. FJ conservatively rates the Om as having a frequency response of 50- 20kHz (+/- 2dB), a sensitivity of 87dB and an impedance of 6 ohms. The crossover point is said to be 2.2kHz where the midwoofer hands over to the tweeter at a rate of 12dB per octave. 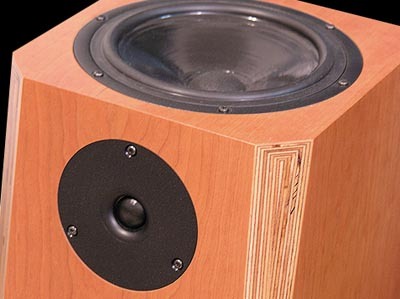 The tiny speaker cabinet is built from one-inch Baltic Birch plywood with heavy internal bracing. At the speaker's bottom is a Nextel lacquered plate made from steel that accepts the Om's tiny adjustable spikes or round metal feet. Around back is a not-so-tiny pair of Druseidt binding posts, not fancy but extremely sturdy and awfully easy to use. Just leave the double banana plugs at the store as the posts are spaced too wide for their use. The review pair came in a lovely Cherry veneer but Walnut and Maple are available, too. Presumably to limit the size of the baffle and alter the diffraction characteristic, the front right and left corners are chamfered to expose what appears like underlying ply layers but is actually a flawlessly applied laminate. It looks nice and further reduces the apparent bulk of these very tiny speakers. am I forced to curtail my use of the 't' word. Because in use, there's just nothing tiny about these speakers. "Cognitive dissonance is the state of tension one feels after making a decision, taking an action, or being exposed to some information [or speaker!] that is contrary to a prior attitude" (Zimbardo et al., 1999, p. 752). Psychologically unpleasant, something must change to diminish the tension - usually the prior misconception. The FJ Oms are just such a pair of speakers. They will challenge that which you've likely concluded from everything I've told you about them thus far. On the matter of efficiency, the 6-ohm 87dB sensitive Om would seem to be a poor match -- on paper -- for a single-ended tube amplifier. However, they spent a lot of time tethered to my Art Audio Carissa with its 16 watts of 845 tube muscle. Tom Hills, the Om's importer, tells me that the entire FJ line is very conservatively rated in this regard. Though there was no question that the 140-watt Canary Audio CA160s would drive the Oms without breaking a sweat, I listened to a wide array of musical types from Pink Floyd to Prokofieff in my modestly sized room. If I ever ran short of power with the Carissa, I didn't notice it. And while the Canarys are extraordinary amplifiers both in terms of power delivery and musical finesse (review to come), in the end I found that the Oms were unusually transparent to the source and they appreciated the added transparency and intimacy that SET amplification is so well noted for. No question about it, though - in medium to larger rooms, the Canarys would have gotten the call with little if any sacrifice. slightly laid back in the mix. It's the only area of the Om's performance where it deviates slightly from complete neutrality. If you seek a treble that shines the light of truth on everything (for better or for worse) and spotlights cymbals and triangles while imbuing everything with an airy sparkle, the Om may disappoint you. Ditto if your idea of musical detail comes at the hands of an over-active tweeter that chisels through everything in its path. On the contrary, the Om produces a slightly laid-back, very sweet treble with no artificial edge or sparkle. It's also extremely smooth. With exceptionally well recorded audiophile fare, you may miss some of the insight that other speakers may bring to the table but on 98 % of the other music you listen to, you'll likely be like me - ambivalent or even thankful. As I've said, the Oms are very transparent but in a slightly different way as compared to, say, the transparency of the electrostatic or Lowther drivers. Take either of those and you turn up the contrast or the black level (to use photographic terms). Light and airy are not words you'll hear used to describe the Oms. They are not light. They are harmonically unusually dense speakers. The word airy doesn't rush to mind either. That's not because the Oms are shut-in sounding or claustrophobic but because they are so harmonically saturated that you don't hear through them as you do with the aforementioned speaker types. In other words, these speakers have real meat on their bones. What makes them transparent to the music and what's happening upstream seems to be an inherently low noise floor. These speakers are clean, just not sterile. That's a good thing. tolerance of plus or minus 2dB that FJ uses in their specification. This leaves room for a variance of only 4dB throughout its entire frequency response as opposed to the 6dB of latitude afforded by the more usual plus or minus 3dB spec that most manufacturers use. Therefore, judge its meager 50Hz bass specification on paper at your own peril. These speakers produce much more bass than seems implied. In my room, they easily produce 40Hz and even as it approaches its cutoff, the Om is unusually full with a stunning level of authority and a surprising ability to energize the room. Following last year's CES, several moonies came back reporting on how good the FJs sounded. I can easily understand why. 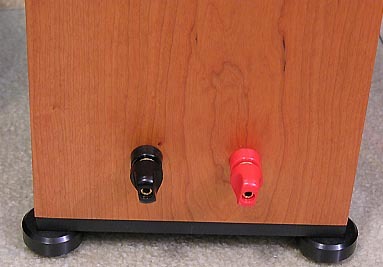 The FJs don't have the true bass extension that will get a large speaker in trouble in some rooms, particularly small ones. But as far down as they go, they sound like much bigger speakers and they're all but guaranteed to work well in most rooms. I'm not talking about the artificially pumped up bass of some small monitors either. By comparison, the Oms produce bass with a sense of ease and certainly an elemental transparency to detail that few such speakers even aspire to. In my room, the Oms exposed to the light bass details I had never heard before. Another contradiction? The Oms don't produce what I'd term the most highly damped bass either. From the midbass through the upper bass, the Oms are fairly generous which gives the speaker real warmth than more highly damped speakers can't muster. Is this code for loose and billowy bass? Nope. It doesn't come anywhere close to that. But if you find a lot of speakers cold and thin, you need to hear the Oms. 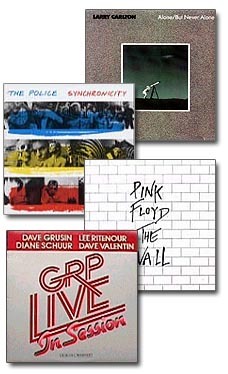 For example, Synchronicity by the Police [A&M SP-3735] is a fairly typical rock/pop LP with the exception that it has some spectacularly recorded bass lines. Not spectacular in that the bass is particularly deep, but spectacular in that what is there is well captured and if the system is up to it, highly articulated. I was taken a bit by surprise to hear just how up to the task the Oms were. Bass was tight, musical and in complete contradiction to the speaker's diminutive size. And as if that weren't enough, the Oms reproduced it all with uncanny ease. In the matter of soundstage development, we learned through my review of the Thiel PowerPoint loudspeakers that the brain doesn't care how tall or short a loudspeaker is - it'll perceive the soundstage as coming from exactly where it should. That is, if the speaker is properly designed and doesn't give itself away as the sound source. In that regard, the Oms are even better than the Thiels were as they produce a soundstage that is huge - recording permitting, of course. It goes wide, it goes tall and it goes deep. The Om is sometimes referred to as an omnidirectional speaker due to the fact that the midwoofer points to the ceiling and radiates freely at 360 degrees on the lateral plane. However, as the driver's output crosses out of the picture at a rate of 12dB per octave starting at 2.2 kHz, the Om is not omnidirectional throughout the entire frequency spectrum. As the tweeter faces forward, the Om doesn't create a soundstage for the wide array of listeners that a true omni like the Ohms or Duevels will. But that doesn't mean that the midwoofer's omnidirectional radiation pattern doesn't pay dividends. I suspect that the speaker's somewhat atypical power response is largely responsible for its spacious sound as well as the aforementioned harmonic density and saturated tonal colors. Micro-dynamically speaking, the little Oms are very good. Nobody will confuse them with highly efficient horns in this regard but the Oms won't be embarrassed by them either. The speakers have very good jump factor when called upon for hard acceleration and in general they stop as well as they start. Macrodynamically speaking, the speakers do have their limits, however. They must. We are, after all, talking about a smallish speaker with fairly small drivers. There will be a limit to its output. But here again, the little FJ surprises particularly at the bottom of its range. In my room, I never observed the speaker audibly distorting or compressing. But then again, I'm no head-banger. If you like your music at levels that endanger your hearing, you'll have to check out the Oms yourself to see if they can do it for you. But speaking for myself, they go satisfyingly loud. If the little Oms deviate from utter neutrality by being a touch sweet in the treble and a touch generous in the bass, they do tow the line throughout the entire midrange and upper midrange. Not only are they neutral but they sound exceedingly smooth at the same time. Again, these speakers have the kind of smooth and rich warmth that allows one to listen all day long. From the opening bars of "Mountain Dance" from GRP's Live In Session [GRPA-1023], the music flowed with an uncommon liquidity and natural ease. The soundstage was wide, deep and lucid. Between the songs, the audience erupts in applause, which goes wall-to-wall and, by far, transcends the speakers' physical locations. As always, the Oms do a fantastic job of disappearing from the room, leaving behind only a sonic hologram of the performance. While Abraham Laboriel's bass lines may lack just a touch of the raw growl that larger and much more potent systems produce, they nevertheless are present, remarkably potent and eminently tuneful. 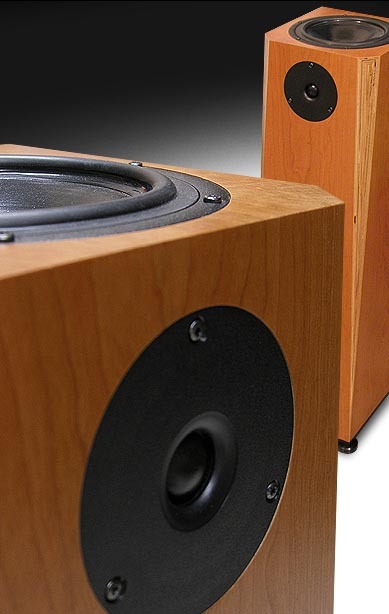 In a moderately sized room, the bass will satisfy all but the hard-core subwoofer addicted. To most -- and particularly those looking for a small speaker that won't overcome a room -- the bass will be both a pleasant surprise and very rewarding. Diane Schuur's vocals on "Reverend Lee" left absolutely nothing to be desired as they came through with devilish confidence and clarity. Ditto for Lee Ritenour's variously voiced guitars that sounded clean, articulated and fully expressive. At the conclusion of "Oasis", there is a cacophony of various cymbals as expressed by percussionist Carlos Vega. It was one of the very few times I wished for just a little bit more sparkle from the Om's tweeter as it just didn't ring with the same transparency and air that other speakers produce. Surely nothing of import was missing but at the same time, I was aware that I've heard it reproduced with a little more panache by speakers with more showy tweeters. Wanting to try something truly big on the little Oms, I brought out Pink Floyd's The Wall [Columbia 36183] and the results were remarkably epic, certainly larger than life, which always seemed Pink Floyd's intent. Here again the Om's unrestrained holographic imaging served this LP very well, whether it was by producing an expansive orchestra or supplementary off-stage antics and special effects or just a huge and intensely dense electric guitar. The bass lines from "Run Like Hell" were propulsive with authority and rhythm but the music was best served overall by the Om's generally natural sense of rhythm and pace. While never sounding artificial or supernatural, the little Oms have an uncanny sense of rhythmic articulation that allows the music to propel itself along naturally and at its own completely appropriate pace. That natural sense of pace was also in evidence on Larry Carlton's LP, Alone But Never Alone [MCA5689] where it served this mostly acoustic music ever so well. Carlton's free-wheeling pizzicatos really showed off the Om's abilities with microdynamics as the entire album came across with a new sense of aliveness. The bass purred along beneath the guitar with similar finesse. And there wasn't a slurred syllable on the entire disc. Articulation was really first class. Guitar notes faded with seldom heard clarity as they disappeared into the Om's uncommonly low noise floor. Tonally the Oms seemed absolutely spot-on and their smooth and sweet treble was the perfect conduit for the upper registers of Carlton's guitar as they spilled into my room with exceptional authenticity. In short, the LP sounded absolutely superb - as good as I've heard it. If you're looking for no-holds-bared brutal honesty, the FJ Om may not be the speaker for you. It's much too good natured and well mannered for that. It represents somewhat of a contradiction in that it's also truly a reference quality speaker and more than transparent enough to allow you to hear every little change upstream in the system. 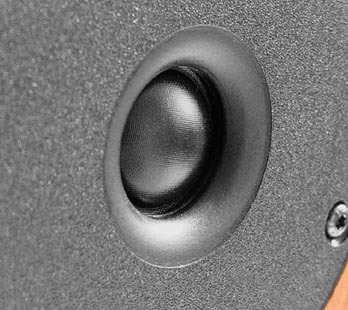 In that regard, the Om truly reflects its designer's understanding of the science of loudspeaker design. However, it's also one exceedingly involving loudspeaker. Eloquent and charming, the Om trades some brutal honesty for a friendly dose of diplomacy in that it seems to reach into every recording to extract its most appealing aspects while it downplays the less desirable ones. 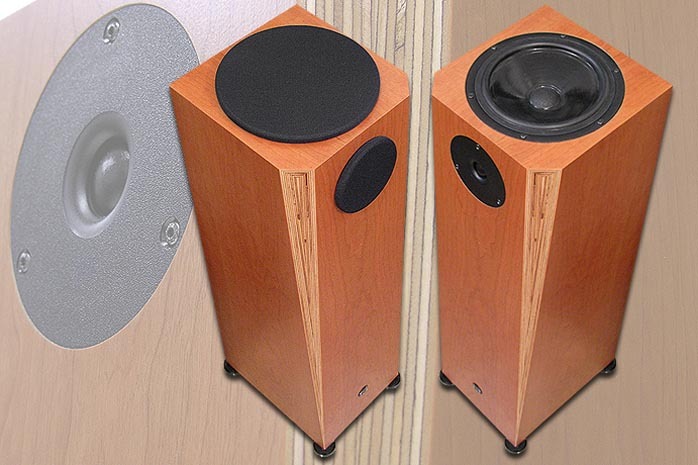 In this way, the Om is a fine example of the art of loudspeaker design. And that it can manage its musically expressive ways while not imposing its will on all recordings makes it a truly special speaker. When you combine its musical personality with its décor-friendly dimensions and high level of finish, the result is one very recommendable pair of speakers. Not to put too fine a point on it then, when it comes to value and performance at this price, these things are anything but tiny.